Mehndi, the art of henna painting on the body, has been practiced in parts of India, Africa and the Middle East for centuries. Henna is a dye procured from a tree: Lawsonia inermis, whose leaves when dried and mixed with boiling water stain the skin with mahogany color. Dried henna plant leaves are made into a paste that produces a temporary dye that lasts up to three weeks. This dye is used to make designs to decorate the skin – usually on hands and feet. Henna has been a popular cosmetic in all countries of the Middle East and the Indian Peninsula, where it grows as a common shrub. Women from these regions use it as a cosmetic to beautify their hands and feet with intricate designs. Temporary henna tattoos or Mehndi has been a part of celebrations in India for centuries. Learn about this decorative body art and create your own design. Mehndi has traditionally been used to adorn wearers for wedding ceremonies and other cultural celebrations. Designs can be intricate and include elements like flowers, swirls, dots and teardrops. How do Mehndi designs vary from culture to culture? 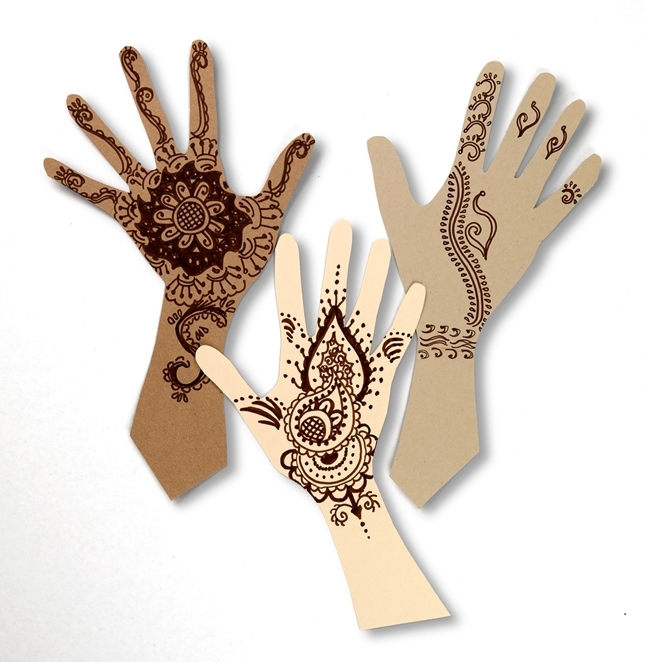 Create a hand to decorate with Mehndi designs by tracing your hand with the fingers spread apart on a piece of construction paper. Use scissors to cut out the hand shape. Study pictures of Mehndi designs. Use a colored pencil to lightly sketch a design on the hand. Make your design intricate and incorporate traditional shapes and patterns. Students research traditional and modern uses for Mehndi, the art of henna body painting. Students observe different designs used in Mehndi and discuss the shapes and patterns. Students create an individual Mehndi design hand drawing using a variety of marker techniques. Research what holidays in India include the use of Mehndi as part of the celebration. Create a drawing to depict one of the holidays. The use of henna dye as a body adornment goes back to the ancient Egyptian culture. Learn how the Egyptians used henna. Invite a Mehndi artist to come into the class and demonstrate the process.